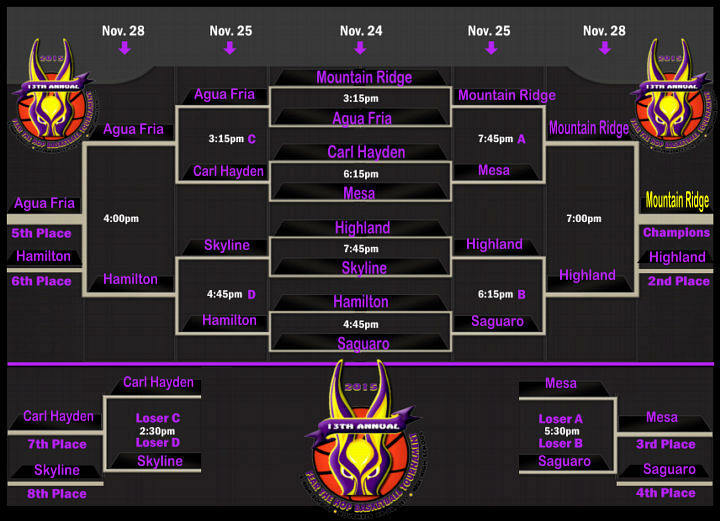 First team in the bracket is designated home team and will wear light (white) colored uniform. 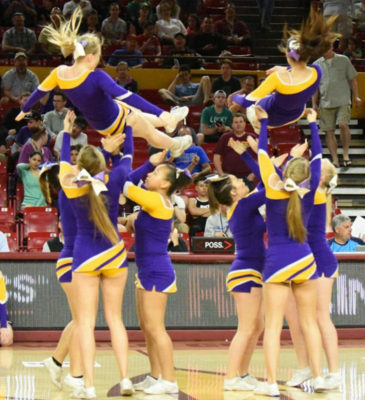 Mesa, needing a lift before halftime, got one from senior guard Drew Hatch. His 3-pointer at the buzzer cut the deficit to four. That pumped life into the second-seeded team. 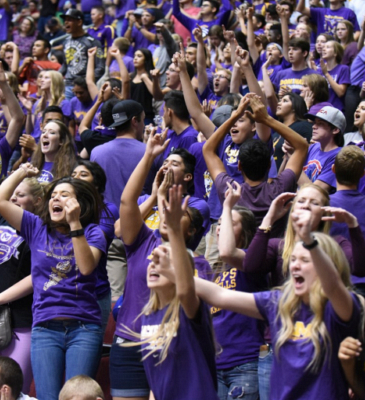 Then, Hatch got help down the stretch from little bother, sophomore Mark, and Mesa captured the Division I boys basketball championship with a 51-48 victory Monday night over No. 8 Phoenix Sunnyslope at Gila River Arena. Sunnyslope methodically built an 11-point lead in the second quarter with guard Dane Maggi hitting a pair of 3-pointers. He had 13 of his team's 27 first-half points. But he needed help, and Mesa started to chip away, behind senior guard Drew Hatch's five points in the final minute. His 3 at the buzzer closed the gap to 27-23 at the half. That Mesa defense that held Gilbert to five fourth-quarter points in a gritty semifinal win showed up in the second quarter when Sunnyslope was held to nine points. 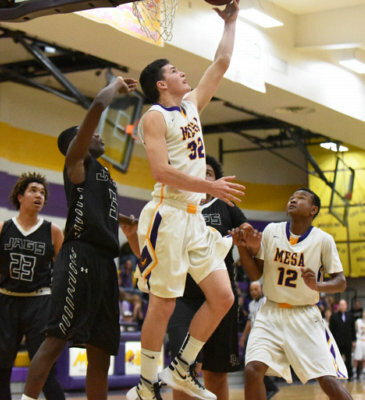 Mesa held Sunnyslope to just eight points in the third quarter and pulled ahead 39-35 on Hatch's 3 and two free throws by Eddie Huff. After a Sunnyslope turnover near the end of the third quarter, Mesa coach Shane Burcar gave a fist pump, feeling the momentum shift. 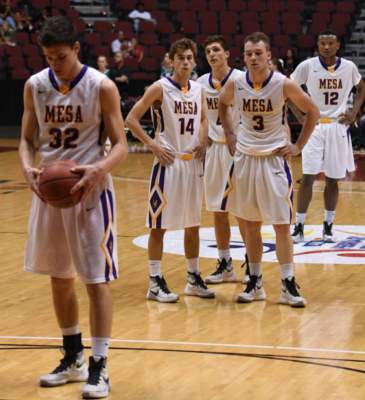 Mesa had its biggest lead, 45-40, with 3:29 left on sophomore guard Mark Hatch's two free throws. After a missed reverse layup by Sunnyslope, Mesa spread the floor and worked for a good shot. Mark Hatch, playing with four fouls, nailed a 12-footer, extending the lead to 47-40 with 2:15 to play. But Sunnyslope wouldn't go away. Maggi converted a three-point play with 1:06 left, cutting the score to 49-46. 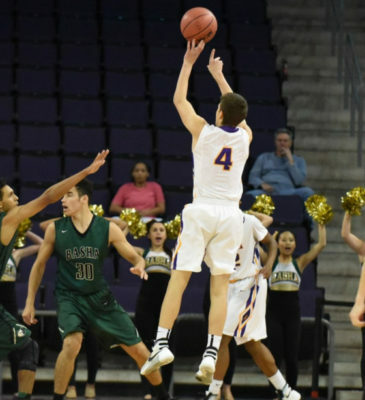 Drew Hatch made one of two foul shots with 55 seconds left for Mesa. 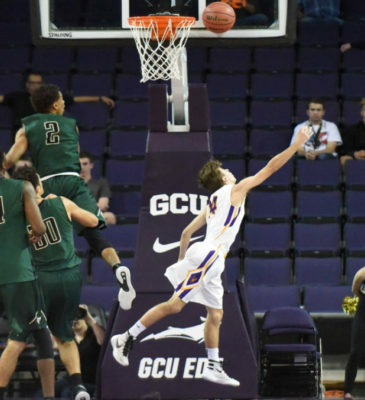 Bryson Mewhinney rebounded his teammate's miss, and, trapped in the corner, called time out with 43.7 seconds left and Sunnyslope trailing 50-46. Maggi missed a 3 and D.J. Henderson was fouled on the rebound. But he missed two free throws, giving Sunnyslope a chance. 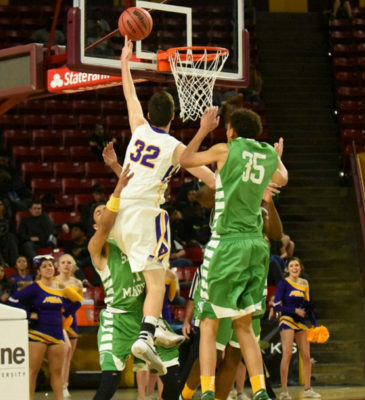 Hank Hibbeler drove in for a jumper that cut Mesa's lead to 50-48 with 25 seconds left. 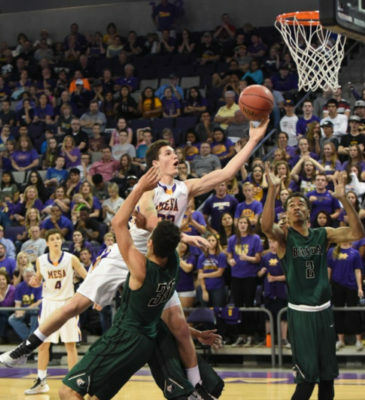 Mesa missed five of six free throws down the stretch, opening it up for a dramatic finish. But Sunnyslope couldn't find any more magic from Maggi, who, coming out of a time out with 5 seconds left, his team down by 3, missed a well-contested 3 from the top of the key. 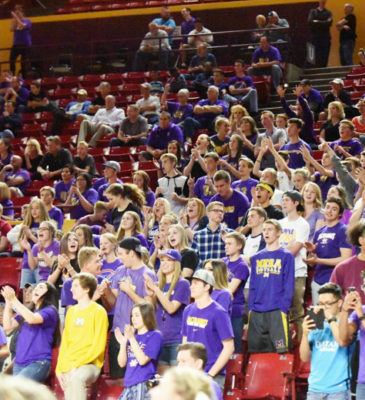 Celebratory screams and cries of joy could be heard from behind the locker room doors as the Mesa Jackrabbits advanced to the Division I boys state basketball championships Friday with a 50-35 win over Basha. 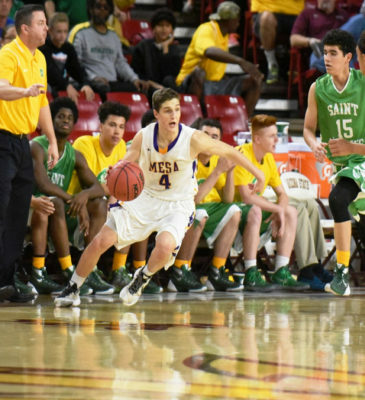 “The guys stepped up [and] made plays,” Mesa head coach Shane Burcar said. 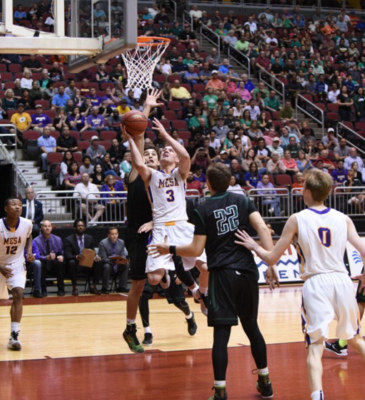 In first half of play, second-seeded Mesa held fourth-seeded Basha to 10 points—the team’s lowest half of the season. 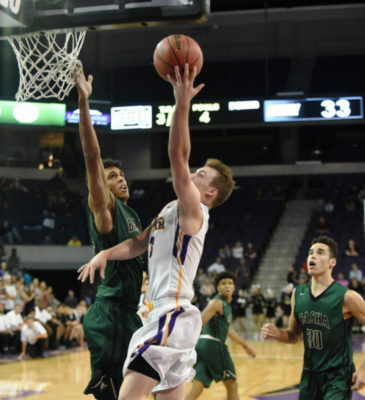 However, Basha rallied back, scoring 20 third-quarter points at Grand Canyon Arena. But unfortunately for Basha, Mesa senior Drew Hatch came out of halftime ready to play. After scoring just three points in the first half, Hatch scored eight points in the third quarter—two of which were huge 3-pointers that gave the Jackrabbits momentum to go on a 10-2 run. 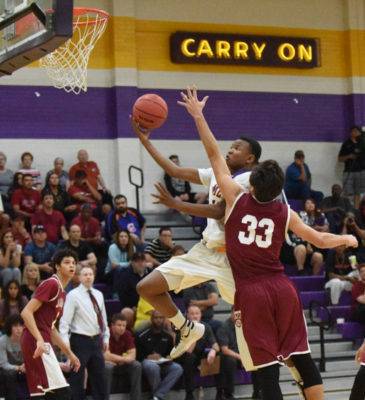 In the fourth quarter, Basha capitalized on Mesa’s foul trouble and tried to rally back, riding senior Antwan Ross-Jones and junior Terrell Jones into the final minutes. 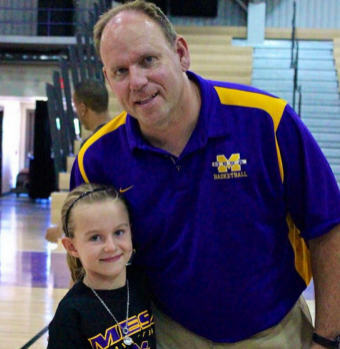 But the Bears came up short and the Jackrabbits advanced to the championship game. Despite the loss, Jones, who led the Basha Bears with 10 points, said he’s looking forward to doing it all again next season. 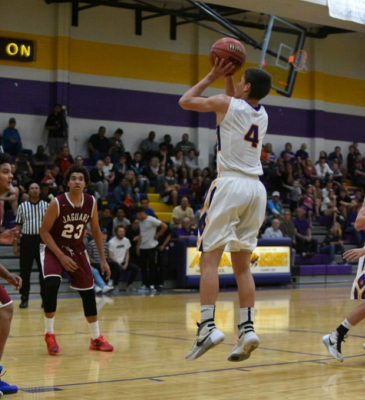 Drew Hatch and his brother, Mark Hatch, combined for 26 points in the contest for Mesa. Senior captain David Cummard also added 10 points. Hatch said it was the team’s execution and attitude that ultimately led to the victory. Mesa coach Shane Burcar acknowledged Drew Hatch’s play as a contributing factor in the Mesa win. “In the last two games, he’s been cold and he’s just a little excited, putting too much pressure on himself,” Bursar said about Hatch’s first half of play. “And in the second half, he just let it come to him. 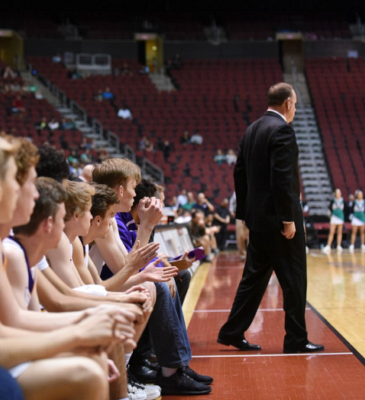 As Mesa gets ready to play either Gilbert or Sunnyslope in the championship game at 8 p.m. at Gila River Arena, Burcar said he wants the other teams to know one thing. The second-seeded Jackrabbits (24-4) gained control with a strong third period and advanced to the semifinals over the No. 10 Knights (17-12). Drew Hatch and Mark Hatch combined for 36 points -- evenly split - to pace the victory. Mark Hatch had 13 points in the second half and Drew Hatch tallied 12 of his after intermission. They accounted for 17 of Mesa's 22 third-quarter points. Both pitched in with two steals each and Mark Hatch handed out a team-high four assists. St. Mary's led 37-30 early in the third period, but with standout Deshawn Wilson exiting in the period with four fouls Mesa took advantage. 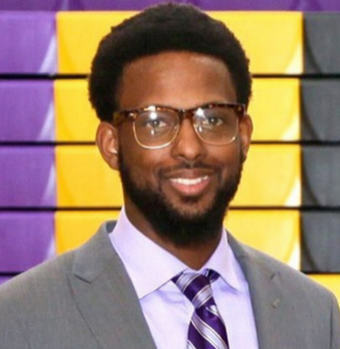 Wilson, who had 12 points at halftime, scored four points in the second half and silent in the final period although he returned to play the entire final quarter. 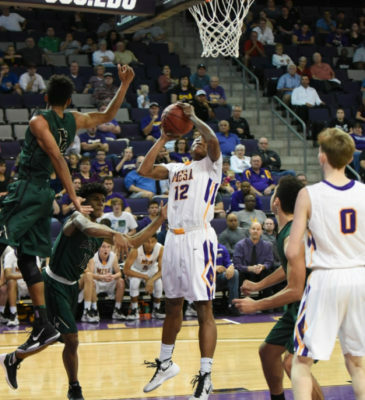 DJ Henderson had a strong game for Mesa with 10 points and nine rebounds. 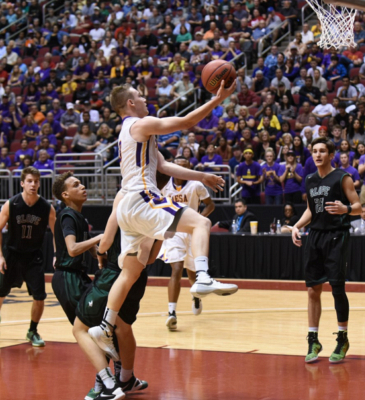 Mesa doesn't have a player with a Division I college basketball offer. But it is a close team. 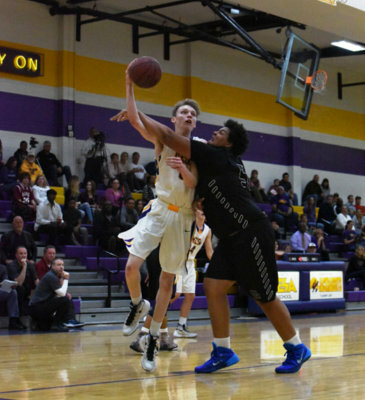 It gets under opponents' skin with dogged defense. And it works for the best shot each time down the court. 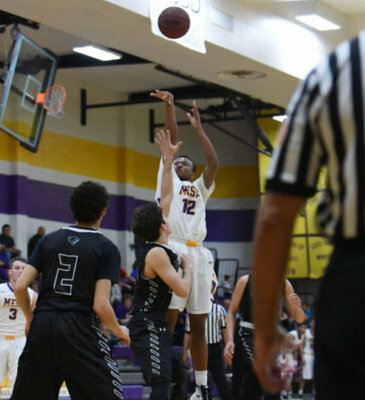 Playing as perfect a final quarter as it could, Mesa dominated Mesa Desert Ridge in the last eight minutes and rolled to the 28th annual Tempe McClintock Holiday Basketball Shootout championship on Wednesday night with a 63-45 victory. Guard Drew Hatch finished with 23 points and the Most Valuable Player award. He left the game with the rest of the starters with 1:26 left and a 62-41 lead. 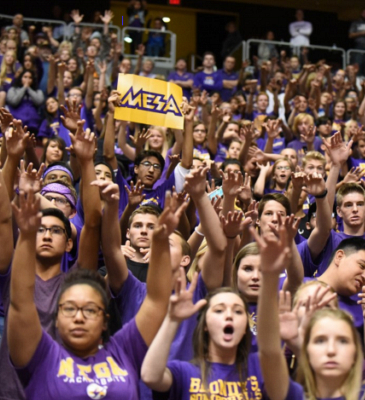 Before coach Shane Burcar emptied his bench, Mesa made all 13 of its free throws (the only ones they attempted in the game) in the fourth quarter and hit all six of its field goals. "We didn't start out so good, but we have a veteran team and we kept battling and played well," Hatch said. "Everybody is committed to their roles. Our team chemistry is unbelievable." 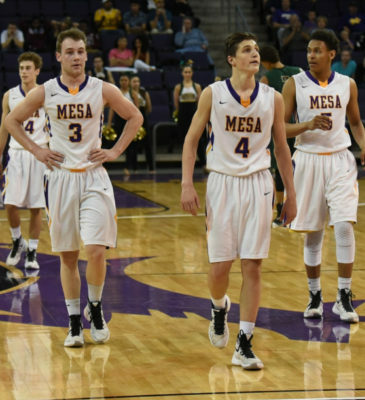 Mesa (13-2) made a run to the Division I quarterfinals last season with a gritty team that is another year tougher and more experienced now. 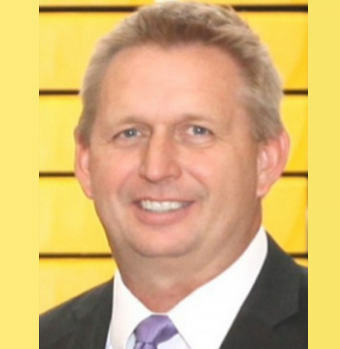 It ended Tempe Corona del Sol's long winning streak against in-state teams early in the season. At McClintock, it made up for losing in the semifinals to Glendale Mountain Ridge in its own tournament during the Thanksgiving break by beating all four opponents by at least 18 points. Mesa coach Shane Burcar feels this team understands its roles. "It's not lip service," he said. "We like to think that we're mentally and physically tough. In the fourth quarter we just executed really well." 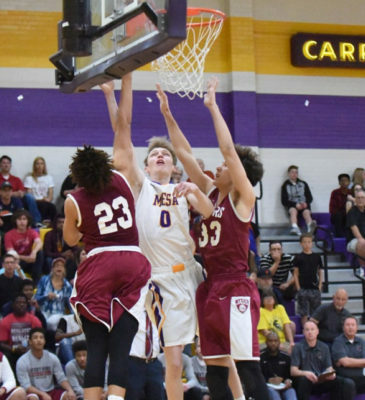 Mesa was holding onto a 37-31 lead entering the final quarter in a game that was tightly contested throughout before scoring seven points on one possession in the first minute of the period, as Desert Ridge (8-6) self-destructed. 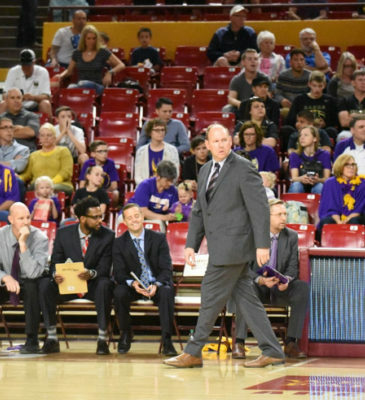 After Maurice Walton, a 6-foot-8 tank, was called for fouling Mark Hatch in the paint, Walton said something to a referee that he didn't like and got assessed a technical. After Hatch sank two free throws, Hatch made the two technical free throws. Then, on the inbounds play, 6-7 Connor Galante scored inside on a feed from Hatch and was fouled. He converted the three-point play, and suddenly Mesa's lead was 46-31. David Cummard gave up about five inches to 6-5 sophomore sensation Timmy Allen, who was held to 15 points, five in the second half. Most of Allen's points came on second-chance shots. "Timmy Allen is a good player," Burcar said. "He's going to get his points. David battled the whole time. He's so strong. I thought his first shot opportunities, we defended really well." 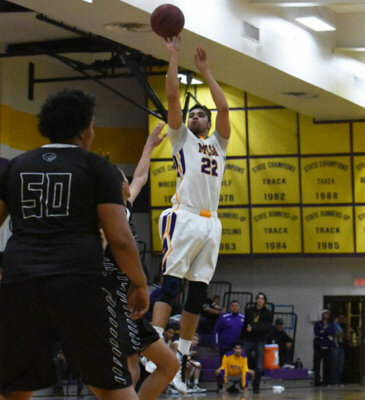 Mesa High used a wire-to-wire performance on Tuesday night to deal four-time defending big-school champion Corona del Sol a 65-62 defeat in the first power-ranking game of the season for both at Jackrabbit Gym. 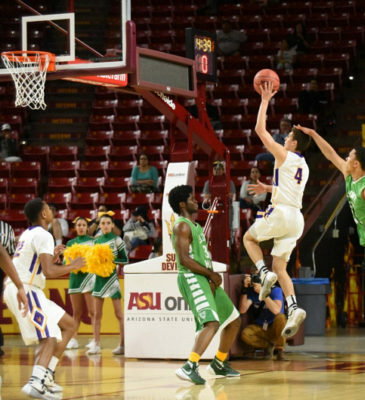 Led by 31 points from senior Drew Hatch, Mesa put an end to two Corona del Sol winning streaks -- a 69-game winning streak against Arizona opponents and a 20-game success streak that finished out the Aztecs' state title run last season. Corona's last loss to an Arizona team was to Dobson on Jan. 29 of 2013. Tuesday was the season-opener for Corona del Sol and new coach Neil MacDonald while Mesa was playing its fifth game after posting a 4-1 mark in its Fear the Hop tourney last week. 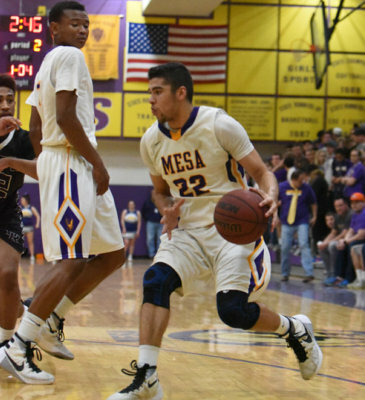 Mesa (5-1) jumped to a 9-2 lead and never trailed in the game. Drew Hatch scored 12 points in the first period and 18 of the Jackrabbits' 27 in the first half. 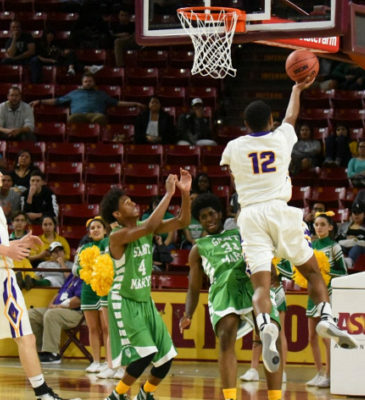 Corona, with two starters back in junior standout Alex Barcello and senior Tyrell Henderson, succumbed because of a slow start, Mesa's dominance on the boards and the Jackrabbits' stubborn hold on the lead that didn't wane until the final 2:30. 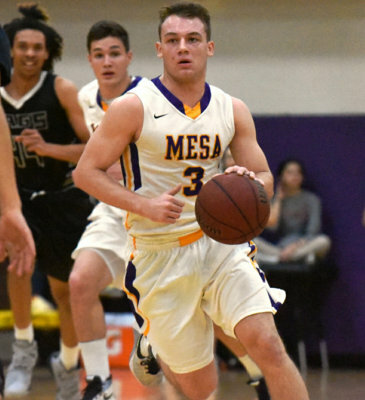 Mesa led at that juncture, 58-46, after Drew Hatch hit his fourth-three of the night and David Cummard sank two free throws. 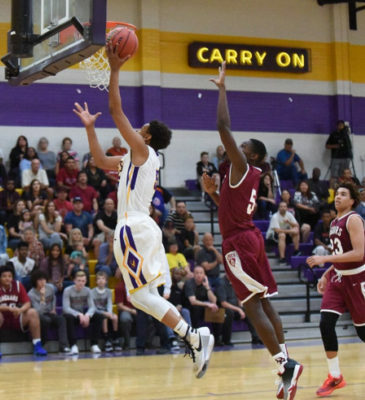 Corona didn't quit, forcing four turnovers in the final 2:30 and getting offense from Barcello and Saben Lee, a contributor off the bench last year. Barcello and Lee combined to score Corona's final 16 points. Barcello finished with 28, 15 of those in the fourth quarter) and Lee ended up with 20 points. 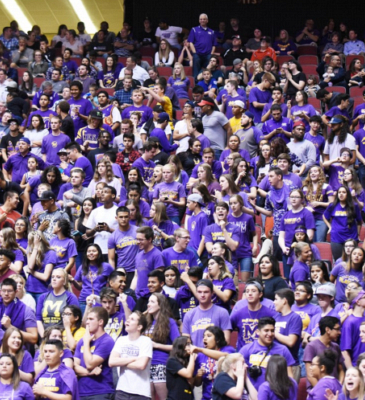 Corona trailed 64-62 after a Barcello layup and had a chance to tie or take the lead when Mesa's fourth turnover late gave Corona the ball with 13.3 seconds. Corona got the ball to Barcello, who managed an off-balance shot in the lane that was off the mark. 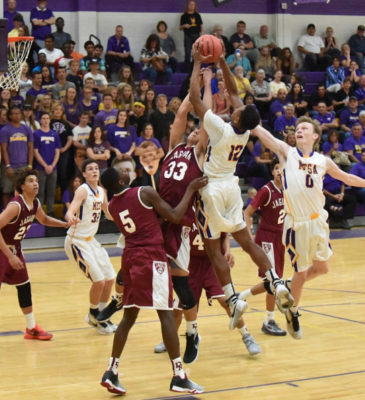 Mesa's Darius Goudeau (12 points) grabbed the rebound and was fouled. Goudeau made 1 of 2 free throws. His miss was on the second and Corona gained possession after a scramble with a final chance to tie with 5.9 seconds left. Down 65-62, Barcello fired up a contested shot from 3-point range that caromed off the front of the rim as time expired. 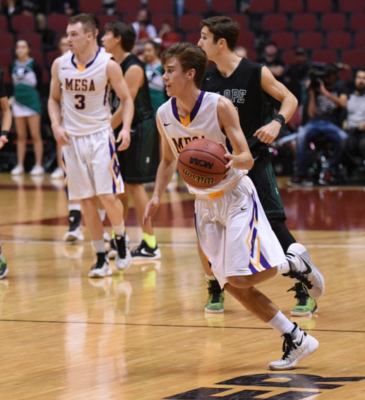 "We almost lost it at the end," Mesa coach Shane Burcar said. "I trusted our guys at the end, but should have called time to help them out. That's on me. We made free throws and that was big." Mesa connected on 13 of 14 free throws in the final period. Burcar felt rebounding would be a key since the Aztecs no longer have Marvin Bagley III and he was right. The Aztecs struggled mightily in the first half and to a lesser degree in the second half due to that. "We thought we could manipulate the game that way," Burcar said. "I thought David Cummard did an unbelievable job (defending) on Barcello, and Barcello still had a heck of a game. He's one of the, if not the best player in the state." MacDonald pointed to defense early and rebounding for the downfall. 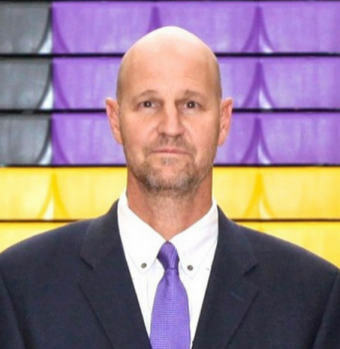 Favorite thing said about Coach ..."He loves his players"
Favorite NBA team: Pittsburgh Ironmen (Basketball Association of America). Favorite NBA player: Moses - not Malone. You know the one that parted the Red Sea. 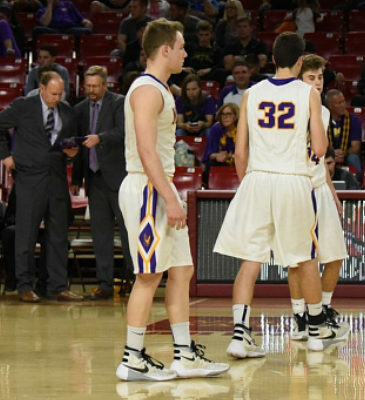 Favorite HS B-Ball moment: Watching my boys play for the Jackrabbits. Favorite Coach Burcar quote: "Just Do Your Job." Pre-Game Ritual: I shadow box in the hall way listing to 80's rock. 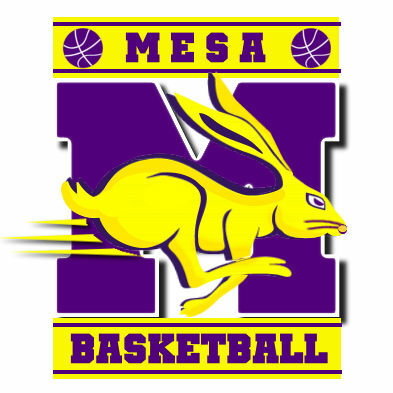 Favorite HS B-Ball moment: Mesa played North at Mesa. One of the better basketball games I ever went to. 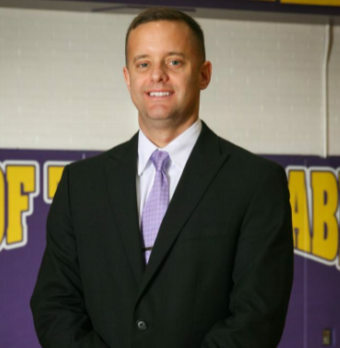 Favorite Coach Burcar quote: "What a Joke." With a Canadian accent. Pre-Game Ritual: I like to have sweets before the game. Favorite HS B-Ball moment: My son Kyle's Senior night. My next favorite will be Zach senior night and State Championship. 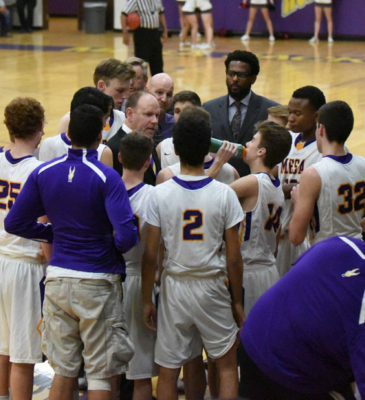 Favorite Coach Burcar quote: "$#&$ Sumeet"
Pre-Game Ritual: I drink a Diet Coke before the game.